St. Martin's Press, 9781250092212, 400pp. 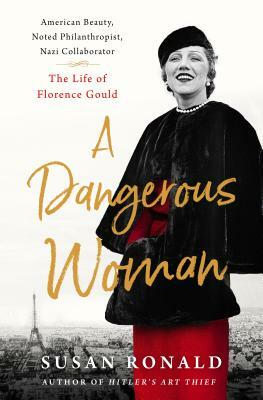 A revealing biography of Florence Gould, fabulously wealthy socialite and patron of the arts, who hid a dark past as a Nazi collaborator in 1940’s Paris. Born in turn-of-the-century San Francisco to French parents, Florence moved to Paris at the age of eleven. Believing that only money brought respectability and happiness, she became the third wife of Frank Jay Gould, son of the railway millionaire Jay Gould. She guided Frank’s millions into hotels and casinos, creating a luxury hotel and casino empire. She entertained Zelda and Scott Fitzgerald, Pablo Picasso, Joseph Kennedy, and many Hollywood stars—like Charlie Chaplin, who became her lover. While the party ended for most Americans after the Crash of 1929, Frank and Florence stayed on, fearing retribution by the IRS. During the Occupation, Florence took several German lovers and hosted a controversial Nazi salon. As the Allies closed in, the unscrupulous Florence became embroiled in a notorious money laundering operation for Hermann Göring’s Aerobank. Yet after the war, not only did she avoid prosecution, but her vast fortune bought her respectability as a significant contributor to the Metropolitan Museum and New York University, among many others. It also earned her friends like Estée Lauder who obligingly looked the other way. A seductive and utterly amoral woman who loved to say “money doesn’t care who owns it,” Florence’s life proved a strong argument that perhaps money can buy happiness after all. Born and raised in the United States, SUSAN RONALD has lived in England for more than twenty-five years. She is the author of A Dangerous Woman, Hitler's Art Thief, Heretic Queen, The Pirate Queen, and Shakespeare’s Daughter.